About seven or eight years ago the Department of Fisheries and Oceans decided that it would be a good idea if the Fraser River of British Columbia, Canada was opened to the retention of Sockeye Salmon to sports anglers. At that time there had been several changes to the regulations that affected what sports anglers could retain. The Sockeye were what seemed to be a good species to possibly appease the river anglers. Sockeye Salmon, after all, are very highly coveted for their dark rich flesh, and there is a very abundant run in the Fraser River. I think that the D.F.O. thought that this would be a politicly smart move because they would look good to the sports fishing industry for giving us a fish that was previously considered a comericial species. 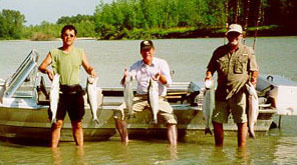 At that time it was commonly believed that Fraser River Sockeye were not easy to catch and that the Sockeye fishery would only be presued with moderate angling pressure. Well what a difference a few years can make! 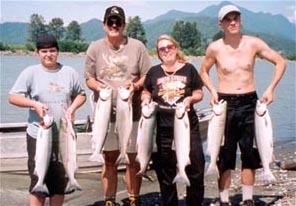 The summer season on the Fraser River of British Columbia, Canada is now considered the SOCKEYE SEASON. I think that even a few local physicians have considered naming the new summer sickness as "sockeye fever" as this "condition" is responsible for more than just a few missed work days throughout the Fraser Valley. If you have never fished the Fraser River for Sockeye you are missing a truly unique experience. Sockeye as it turns out are very catchable in the Fraser River. Over the past several seasons our fishing techniques have been refined to the point where their effectiveness is truly incredible. The only factor that decides if you will catch Sockeye is that there be good numbers of Sockeye in the river, and if they are there you will catch them. Its that simple! The Fraser River is a beautiful place to spend a day of fishing , there are many bars to fish from and explore. Make no mistake that this is a busy fishery, and during peak season there can be between 2,000 to 5,000 anglers per day fishing for Sockeye. I bet when D.F.O. decided to open the Sockeye to the sport anglers, they had no idea what they were getting themselves into. Good, bad or otherwise, Sockeye season is definetly here to stay. The first rule in planning any successfull fishing trip is to be there when the fish are present. Sockeye salmon start showing up in the Fraser river as early as June, but the second or third week of July is when the larger runs come in and by the first week of August the river is usually full of fish and sockeye fever is rampant! 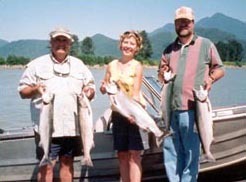 The Fraser river usually produces great fishing well into September. When most anglers think of fishing on the Fraser during July, August and September Sockeye is the prime target. There are however a couple of other cousins of the Sockeye available to anglers. Chinook salmon, Springs, or Kings are a real bonus. These brutes range in size from 10 to 50 lbs and you will sure know it when you have hooked one of these instead of a sockeye. Any Spring or King Salmon over 20lbs will likely need to be chased from a boat if you plan on landing it successfully. Chinook salmon are available through out the "Sockeye season" and are an exciting event in any ones day! This year is a "Pink" year. 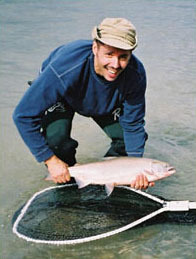 Pink salmon will be present in the fraser river. These scrappy and aggressive fish run every second year and are abundant and easy to catch. Pink salmon start showing up around the last week of August and run strong through September. The majority of Sockeye fishing takes place on the Fraser river from Chilliwack to Hope. There are literally dozens of bars all up and down the river. For the angler who does not have a boat, some of the more popular locations are the Island 22 bar, Peg leg bar, Jones bar, Herling Island and the infamous Scales bar in hope. Any of the Tackle shops in the Fraser valley will be able to give directions to any of the these fishing bars. As far as which one is best, well that changes from year to year and as the water levels flucuate during the season. It is safe to say however if the fish are in they will be caught at all of them. Boat anglers do have an advantage, there are just more locations to chose from and with a little exploring you just might find a "secret" spot that no one has discovered yet. A word of caution to boaters, the fraser river can be a dangerous place. One second you are in 25ft of water and the next you have run aground on a gravel bar only 6inches below the surface. The Fraser river also has some serious currents so be very carful and keep your eyes open as the river changes from day to day. 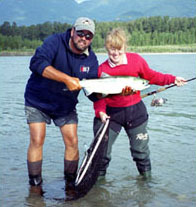 While the Fraser river Sockey fishery was evolving over the past few seasons so were the techniques used to catch the fish. Bottom bouncing has become far and away the most popular method of catching Sockeye, Springs and Pinks during this 0time of year. The set up for bottom bouncing in the Fraser is unique to this system and is incredibly effective. Truly the only requirement to catch Sockeye this way is that they actually be there in reasonable numbers and even beginners will experience good results! The fishing gear required to bottom bounce the Fraser is pretty standard stuff. A 1O.6 ft graphite steelhead rod and levelwind reel is the typical river set up will be perfect. If you are new to river fishing and don't have such a outfit, a medium action spinnig rod and reel in the 8 to 9ft range will also get you started just fine. The termanal tackle or rigging required is very simple but must be set up correctly for best results. First and formost is the main line. This is the fishing line that is stored on your reel. Do not go cheap here, when it comes to fishing line buy quality or you will be sorry. A 15lb to 20lb test is perfect for mainline, 150 to 225yds capacity will be required, especially if you hook a big Spring. The next item in line is just a basic swivel, size 10 or 8 will be just fine. Attached to the swivel will be the weight, this choice is not as simple as it seems. 1 to 3 ounces depending on depth and current speed will be required, but the style and selection is a bit more confusing. There are several different types of weights on the market that work well for Sockeye fishing in the Fraser. First is standard pencil lead, its cheap and versatile. Pencil lead is purchased in 1 lb coils. This means weight selection is unlimited because you just cut off the amount desired and attach it to your line. Pencil lead sticks with preinstalled eyelits are also available. The next type is called slinkes. This is parachute cord with lead or steel shot pushed inside, the ends are heated shut and a snapswivel is installed at one end for attachment purposes. Slinkes work very well in snaggy areas because they do not hang up as much as other weight systems but they do not have as much bottom "feel" as some other styles of weight. The next style of weights are called "bottom runners" or "bouncing betties" These round weights are probably the most popular and effective in use on the Fraser river. There are actually two distinct types available, lead and composit, both have advantages and disadvantages. First the lead weights. These weights are smaller in size than the composits. This can be good in the faster water where 2 or 3 ounces may be required because the lead weights get down very quickly. In the morderate runs where only 1 ounce is required, the small 1 ounce does tend to hang up more often than the composite style. In moderate and moderate-fast water, the composit weights work very well and have tremendous bottom "feel". 1 and 2 ounces are the most popular in this stye. Next on the list is the leader. The leader should be one or two line rating less than your mainline, 12 or 15lb test is perfect. Choose a high quality, abrasian resistant, stiff mono for this job. Leader length should be between 6 and 10 feet, yes! I said feet not inches this is very important. The lure on the end of your line will be made up of either Spin 'n' glows, corkies and/or yarn, so don't worry too much about the color, as long as its mostly green. Size 12 or 14 is perfect for the spin 'n' glo and corkies. Last on the list is the hook. Standard steelhead style hooks are perfect, size 1 to 3/0 work fine. Remember, as with line, you get what you pay for. Buy quality hooks, its worth it. Finally, now that we have our bottom bouncing set up all ready, how do we fish it? Well it is not all to difficult but will require some practice to fully master. Basicly you will want to make your cast slightly up stream, then immediately pick up your slack line, but do not retrieve. Allow your gear to bump along the river bottom. While your gear is travelling along the river bottom, follow its direction with your rod tip and hold your rod at about 45 degrees, as your line starts to flow past you feed additional line out to extend your drift. After you have gone about 25 yards, then retrieve and repeat as necessary. When you are first getting started don't worry too much about feeling the bite or take of the fish. It is very subtle and for the most part this will take care of itself as the rod will just bend over and get heavy and the fish is on! Fraser river Sockeye fishing is unique in that this is an abundant fishery, so retention of fish is permited and this is a good thing. There is nothing better than enjoying a fresh sockeye with family and friends that you actualy caught yourself. As anglers we have a responsibility to make sure that the fish we retain are not wasted. Here are a few tips to make sure your catch makes it home in prime condition. Once you have caught a Sockeye and have dispatched it, cut or pull out a gill from both sides of the fish. This will allow the fish to completely bleed out. Bleeding stops any bruising and improves the quality of the meat. Allow about ten minitus to properly bleed out the fish. As soon as the fish is finished bleeding then clean or dress the fish immediately. Once the fish is properly dressed out, you must store it on ice in a cooler. I have seen many Sockeye stored unbled and uncleaned on the beach or in the shallows by the beach basicly rotting in the sun, this is such a waste and is not necessary After all the effort and expense it takes to go fishing, it just makes good sense to make sure our catch comes home in prime condition and not as fertilizer. The reality of living in a populated area is that when the weather is warm and there are lots of fish around, the people just seem to come out of the woodwork! The fact is, you will probably be fishing with other anglers, in some cases, lots of other anglers. In peak season, 3000 to 5000 anglers per day will fish the Fraser river for Sockeye. The good news is that the Fraser is huge and there is room for all. Here are a few tips to help everyone to get along. First, treat everyone else as you would like to be treated. Second, don't crowd out the person fishing in the spot you wanted. If he or she is there first go somewhere else or wait your turn. Third, parents don't let inexperienced children fish in crowded conditions, it causes nothing but havoc. Fourth, anglers be patient with inexperienced children, even if they have just snagged your line for the tenth time in a row .Its not their fault that their father is more concerned about catching fish himself than teaching them how to fish properly. Fifth, leave the ghetto blaster at home!! AC/DC or Metalica is not part of a quality fishing experience. Sixth, pick up and pack up your own garbage! Your mamma is not here to pick up after you! Remember, the Fraser belongs to all of us, a little common sense and mutual respect will make for a great days fishing for all. Do the Sockeye of the Fraser river actually bite?, or are all of them flossed or lined? Well, I believe the answer is yes and no. First, what is flossing or lining? This is the practic of swinging a long leader (6 to 10ft) along the bottom of the river with the intent of having that leader swing through the mouth of the fish swimming upstream. When the leader swings through the mouth of the fish, it is followed by the hook, which then gets pulled into the corner of the fishes jaw. First, is this legal or is this just snagging? Snagging, by the letter of the law, is described as the intent to hook a fish in a part of the body other than the mouth. Lining or flossing is designed to hook the fish in the mouth, so technically, this is legal. I personaly know several conservation officers who also avidly fish the Fraser in this manner, so from their standpoint, there is no legal problem. Any fish that is unintentionally snagged should be quickly and carfully released as keeping a fish that has been foul hooked is illegal and unethical. Second, will Sockeye bite a lure? The answer is yes, but when you consider the conditions in which we are fishing in the Fraser where the water visability is approximately 6 to 10inches and the water where the Sockeye are caught most often is fairly fast. Sockeye only get about a 1/2 second to see and react to a bait. So some sockeye do bite, but yes the majority are definately flossed or lined. Some people feel that this type of fishing is unethical, personaly because of the conditions in the fraser I think there is a place for this technique here, but in other clear water rivers where Salmon run and the conditions make it possible to fool a fish into biting your lure, I feel this would not be ethical. Basicly, this is a personal decision, but as I see it, most anglers have decided to accept this style of fishing and enjoy this tremendous fishery that the Fraser river has to offer. Over the past several seasons it seems that the Sockeye season has been bogged down in controversy and political nonsence. Well thats because it has! ( Dont get me started!) As I sit here writing this in preparation for this magazine and the upcomming fishing season I really can't say 1OO percent that there is actually going to be a Sockeye season at all. The predictions are huge and things look really good, but you just can't predict what the Department of Fisheries and Oceans is going to do this year. Last season was not bad, they could have opened the fishery a little earlier than they did, but all in all, it was a good season. The D.F.O has a habit of making political decisions, not necessarily the right decisions. All we can do at this point is hope for the best and wait for the word. Your local tackle shop should be up to date as to when the fishery opens and to the retention limits of the various Salmon species. It has been an interesting 8 years or so since the fraser river was opened to Sockeye fishing... to say the least. This fishery has changed not only the sport fishing industry but to some degre the summer lifestyles of the anglers who fish it. This is an amazing fishing experience. With warm weather and plentiful silver fish, its no wonder why Sockeye season is so popular. One thing is for sure, whether you love it or hate it, and most anglers love it, there will not be a cure for the Sockeye fever of the Fraser river any time soon.